Worst Best Picture: Is Out of Africa Better or Worse Than Crash? In “Worst Best Picture” we search every single Best Picture Oscar winner of all time from 1927 to present to uncover the worst of them all. Conventional wisdom says that 2005’s winner Crash is the worst winner in history. We won’t stop until we’ve tested every last one. Read the the first, our review of Crash, here. Posts will be relatively spoiler free, but there may be some details revealed. Today’s installment is the 1985 winner Out of Africa. Is it better than Crash? In 1985, Roger Ebert wrote a glowing review of Out of Africa. He summed up his review with this: “Out of Africa is a great movie to look at, breathtakingly filmed on location. It is a movie with the courage to be about complex, sweeping emotions, and to use the star power of its actors without apology.” It won Best Picture, Roger Ebert loves it, we’re good, right? That’s all we need to do, here? Nah. Out of Africa has been rethought completely, and it consistently makes “worst” lists of Best Picture winners. I can see what Ebert loved about it — it’s certainly “a great movie to look at” — but while it may be complex and courageous, it’s pretty damned bland. 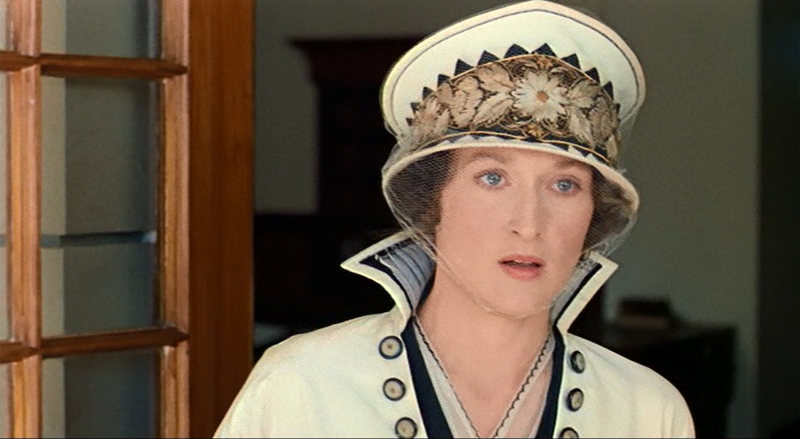 It’s the story of the rich Karen Blixen (Meryl Streep) who needs a title and becomes a baroness by marrying the important-but-poor Baron (Klaus Maria Brandauer). They plan to move to Africa and start a dairy farm, but the Baron is an idiot and sets up a coffee plantation. This is the first of his many, many foolish mistakes, and it’s tough to determine if he’s supposed to be stupid or reckless. It doesn’t really matter, because he only stays on screen long enough to run poor Meryl Streep’s life. He leaves her with a loveless marriage of convenience, a coffee plantation that can’t grow coffee, and a life that she doesn’t understand. The feeling of loneliness is real, and Meryl Streep of course sells it. She’s the lone redemptive quality of Out of Africa, and it’s impossible to not feel for her as her life gets destroyed rather early in the film. The Baron gets syphilis and gives the gift to her, so then she’s even out the ability to have children. Things look pretty dark, but she at least has the courage and ability to throw him out of the house. She may not be getting much from him, but he’s at least not going to get anything back. She starts a school for local children in lieu of having her own, and things definitely look up when she meets the dashing, ridiculous Denys Finch Hatton (Robert Redford). Redford is pretty dreadful in this, but that may owe to the fact that his character is just a rugged outdoorsman who has no defining characteristics beyond “rugged outdoorsman.” They fall in love, but will her syphilis or his wanderlust ruin their love? Can they make a life together in the distant, unfamiliar land of Africa? Is he ever going to turn into a real character? You’ll have to watch all 161 minutes to find out! Out of Africa has been rethought mostly because a 161-minute movie with (and this is a stretch) 2.5 characters is tough to pull off. Redford’s acting seems like it comes from many decades earlier, and it’s really hard to see how he got so much praise in the 80s for this one. Streep is great, but she’s always great, and she’s not enough to carry this bloated mess. If you’re looking for forbidden love, watch From Here to Eternity, or, and I hate to say this, The English Patient. This one just isn’t worth your time, though it seems to have tricked people when it came out. The Best Part: Meryl Streep. The Worst Part: Everything that is not Meryl Streep. The “dashing-I-got-this-watch-me-kill-this-jungle-cat” Robert Redford performance is especially bad. Is It Better or Worse than Crash? I don’t think Out of Africa is worse than Crash. The ending is pretty good, and honestly Meryl Streep’s depression is genuinely evocative. It’s a tough movie to watch, though, and I can’t suggest that you do it to yourself.